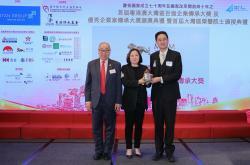 MGM is the only Macau enterprise to win the Top 100 GBA Enterprise Heritage Awards. In celebration of both the 70th anniversary of the founding of the People’s Republic of China and the 40th anniversary of China’s reform and opening-up, the Guangdong-Hong Kong-Macao-Bay Area Economic and Trade Association held The First Guangdong-Hong Kong-Macao-Bay Area Top 100 Enterprise Heritage Awards and Outstanding Entrepreneurship Awards Ceremony. MGM is proud to be the only Macau enterprise to win the award, alongside some long-established companies in the Greater Bay Area (GBA), such as the Swire Group and the Lee Kum Kee. The Awards aimed to recognize outstanding enterprises that have demonstrated their commitment to shareholders, employees, guests, customers, communities, and environment, while making the GBA a world-class city cluster.